— The year was 1966 and NASA was testing its first fully-assembled, 363-foot tall Saturn V moon rocket at its launch facilities in Florida. Despite the threat posed by a hurricane and a ruptured fuel line, the trials with the sky-scraping booster had gone well and it came time to separate the Saturn into its five stages in the voluminous Vertical Assembly Building that had been erected for that very purpose. But NASA engineers had another idea: though the rocket had been analytically designed to be structurally stable, they saw the opportunity to gather some real world data about how the booster would react to vibrations imparted by wind and other outside forces. So, they proposed to set the Saturn swaying. And what better way to do that than to exert force on the tower by having one group lie on their backs and push with their feet while another pulled a rope tied to the opposite side? Really, what possibly could go wrong? The first Saturn V rocket was never destined to launch to the Moon, let alone leave the ground. Assigned the designation SA-500F, the full-size but not flight worthy rocket was designed for use as a facilities demonstrator. Before NASA could launch a Saturn V, the agency's engineers and technicians needed to test the equipment that would be used to assemble, transport and prepare the booster for liftoff. On May 25, 1966, 500F made its first trip out to the pad atop a crawler transporter (the same pad and crawler are still in use today by the space shuttle). Testing continued successfully throughout the summer, only interrupted by a series of minor problems. 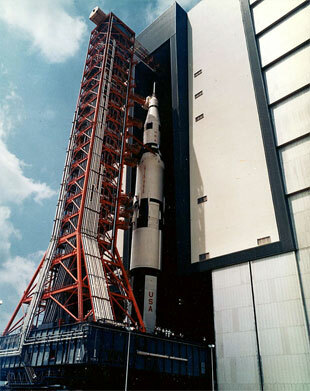 On June 8, the Saturn V was rolled back into the Vertical Assembly Building (VAB) temporarily as Hurricane Alma moved close to the Florida coast. As the winds remained below critical levels, the ground crew expressed surprise by the order to return the rocket to its shelter. The general consensus among workers was that the center's director, Kurt Debus, had called for the roll back as an opportunity to practice a maneuver not yet tried. Ray Byrd, a Boeing mechanical systems engineer for the Saturn V's first stage, remembers spending a lonely night monitoring pressures in the rocket as it was returned to the VAB. There were concerns related to maintaining the integrity of the stack were the pressures to fall. Byrd sat alone on the crawler beneath the booster as it swayed in the driving rain and high winds. Another Boeing engineer, Art Scholz, was stationed as an observer in a cab on top of the mobile launcher platform, where he reported measured wind velocities. Byrd recalls the fear in Scholz's voice as he called back during gusts. Byrd, Scholz and the 500F made it safely inside the VAB that evening and two days later, on June 10, the rocket returned to the launch pad for further fuel loading tests. During propellant loading trials on August 19, an 18-inch liquid oxygen (LOX) feed line ruptured, dumping 800,000 gallons of fuel from the storage tank at the pad. The loss of propellant caused the inner shell of the LOX storage tank to collapse inwards 16 feet. Re-pressurisation of the tank popped it back out again. Testing with the rocket was completed at the pad and on October 14, it was brought to the VAB to be destacked. There were tentative plans, never realized, to reassemble SA-500F and repeat the facilities checkout operations at the other Saturn launch pad, 39-B, the following summer. What happened next may never have been known — let alone believed — had a long-lost film clip not surfaced on the website NASASpaceflight.com. The 60-second video, which was shared by an anonymous source, was titled "Tennis Shoe Test" and shows what appears to be NASA engineers pushing and pulling at the top of SA-500F with their feet and rope respectively. Set to a soundtrack more suitable for Charlie Chaplin-style slapstick, the video was seen as humorous. Indeed, as Byrd related in response to inquires on behalf of collectSPACE.com, "We repeatedly had hearty laughs in response to [the] hilarious telling and retelling of the event." However, Byrd's account of what transpired that day went well beyond laughs at what the video revealed. Byrd relayed the recollections of Stan Smith, an engineer with whom he had worked with inside the VAB and who was present for the test. "One of Dr. Debus' ex-German scientists had apparently been involved in structural engineering analysis of the Saturn-Apollo vehicle as a complete, integrated stack; perhaps related to flight vehicle mechanics/aeroelasticity and such related things as wind shear limitations on launch criteria, etc.," wrote Byrd in an e-mail. A group of technicians was gathered, laid on their back on the floor in one of the upper extensible platforms, placed their feet on the side of the vehicle and pushed mightily in an effort to make the vehicle stack sway back and forth in a vertical bending mode. In theory, the resulting pendulum- like swaying of the vehicle has a natural frequency which can be used to gain insight into the 'system' structural mechanics," he explained. "The stiffness of Saturn was, of course, substantial. Pressing with human feet on the side at a max-diameter station did not produce highly visible swaying of the stack. Data was apparently considered unacceptable," Byrd continued. "The test team then went to an upper platform, attached a rope to the vehicle somewhere near the command module, and several men heaved mightily and released the rope." "Evidence of [the Saturn's] sway was much better." Byrd's account of Smith's tale up to this point coincide with the actions taken by those in the film clip. That the video then cuts off is understandable given what Byrd says followed. 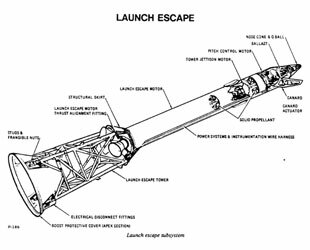 "However, the launch escape rocket (LES) attached to the bow of the command module also swayed; enough to cause failure of the attaching truss structure. 500F was not a flight vehicle, and the LES was filled with sand to approximate flight weight of this fairly large solid rocket." "During this test it broke loose from the command module and fell." "It was around midnight when I heard a 'loud' bang in the high bay of the VAB where this test was being performed. Every thing [then] got real quiet," recalled James Moos, who at the time was a Boeing instrumentation technician assigned to the Saturn V's first stage, in an e-mail sent to collectSPACE. "We took the elevator up to the 27/28 floor to where they were working and saw that the launch escape tower had detached from it's mounting ring," wrote Moos. "The tower [had] slid down on top of the capsule." The LES, the tower that sat atop the Saturn V giving it its nearly 365 foot peak, could have had a long way to fall. "My recollection of Stan's story is that it fell all the way to the mobile launcher platform deck (or even the building's floor)," wrote Byrd. 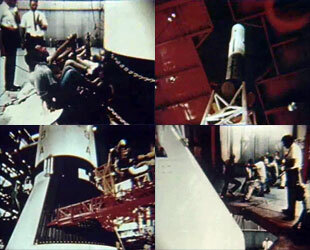 "All the access platforms were extended around the Saturn V, but leaving a gap to perform this test," Moos explained. "So for the LES to fall to the zero level of the platform, it would have had to pass through multiple platforms. It did not fall 365 feet to the mobile launcher or the VAB floor." Byrd affirmed that even though the test had the approval to proceed, that it was done without the usual planning, review or formal scheduling as is often associated with work on such projects. As such, "the LES facsimile failure and destruction was hushed up and never widely reported. Fortunately, no one was injured... or worse," he concluded. Attempts to locate official record of these events were unsuccessful, which would be consistent with a cover up. The Saturn V Semi-Annual Progress report, the official Marshall Space Flight Center document that covers this period, describes the de-stacking of all parts of the rocket except the LES. In addition, the MSFC Saturn V quarterly film report also makes a similar exception as does the Chronology of the Marshall Space Flight Center for 1966. That the video of the tennis shoe test surfaced now, 40 years later, may have been a result of today's engineers' efforts to learn all they can from the Apollo program as their work proceeds toward designing the next generation of moon-bound crewed vehicles. "The more of [these lessons] that this generation of engineers can be made aware of, as to what to look out for, then we will avoid the costs that finding those ourselves would have incurred," Jeff Hanley, NASA's Constellation Program manager, told collectSPACE. Still, the chances of a launch tower breaking away during a test have been lessened by today's technology. "We have a lot of capability today that the Apollo generation didn't have to model things," Hanley explained. "There's still the possibility of being surprised but we can do a lot of testing in the computer today that we couldn't do back then." So does that rule out a repeat of the tennis shoe test? "I would like to think [so], but maybe we would do one just to give somebody confidence somewhere," he said. Alan Lawrie is a satellite propulsion engineer and has worked in the space industry for over 24 years. He is the author of "Saturn" (Apogee Books, 2005), which offers the complete history of the Saturn V's construction and testing. Robert Pearlman is founder and editor of collectSPACE. A version of this article was published concurrently in the British Interplanetary Society's Spaceflight magazine. This article was updated on January 8, 2008 to include the comments of James Moos.